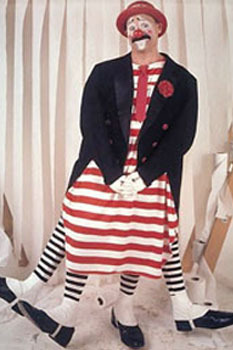 Jeff Gordon (Le Clown Gordoon) has been performing as a clown for nearly 30 years. He has performed all over the world, including serious stints under the tent of the Big Apple Circus; on Broadway with Bill Irwin; as a member of the Big Apple Clown Care unit in hospitals all over New York City, on cruise ships, and in movies, theatres, and other venues. Utilizing circus skills, audience participation, improvisation and puppetry, Gordoon brings joy and laughter to all of his audience members. His one man show is called Fools Foolin’, and finishes with his signature act, where the clown blows billowing rolls of toilet paper high up into the air with the use of a powerful leafblower. 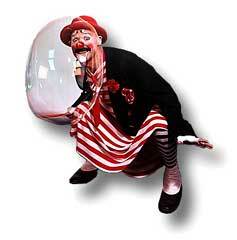 This act has since been appropriated by many clowns all over the world. Pennsylvania Performing Artists On Tour website.